BudcoSecuritySeals.com is a stocking distributor of the security cable seals you need. Budco stocks several sizes of security cable seals including CTPAT compliant and ISO 17712 Certified High Security Cable Seals. Cable Seals 1/8th inch and larger meet all ISO 17712 and CTPAT regulations. Our security cable seals are typically in three sizes: 1/16th inch, 1/8th inch and 3/16th inch. Each with different cable seal design characteristics to meet your cable seals application. Our stock security cable seals ship in 24 hours. We can also provide custom security cable seals to meet your color, custom imprint, barcode, seal length and many other custom needs. Our cable seals feature non-preformed security cables that fray when cut for easy tamper evidence. 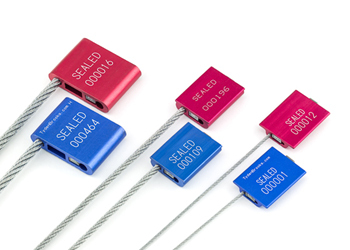 Durable aluminum or zinc metal bodies provide maximum security for all cable security seal applications. Great for use on rail cars, transportation containers, tank cars, truck trailer doors. Cable seals are great for use where a barrier is needed to entrance. Order Your Cable Seals Today! Click to see our complete line of Cable Seals and Security Seals.